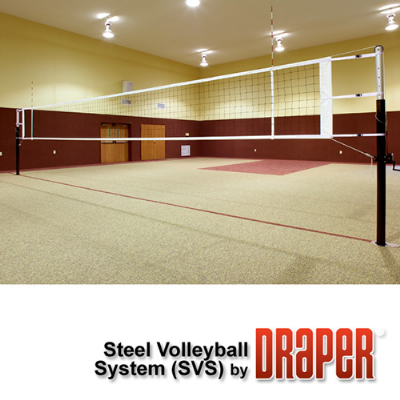 SVS Steel Volleyball System incorporates all of the quality features of our PVS Volleyball System with telescopic steel posts. The Draper SVS is designed for programs on a budget or ones that prefer the rigidity of a steel post. Stiff steel post allows the user to rapidly obtain the desired net tension. Each post has a 6’ lower section constructed of 3-1/2" (89mm) diameter 11 gauge steel tubing, an upper section made of 2-7/8" (73mm) O.D. aluminum tube with .300" (8mm) wall thickness and a large nylon bushing to insure smooth operation. Height adjustable from 6’1" (185cm) to 8’4" (254cm) in one inch increments with precise mechanical pin adjustment. Each upright features an adjustable rubber foot to allow for exact height adjustment and to protect your floor. Winch features a folding handle to provide maximum player safety.